How are snippets retrieved by Firefox? 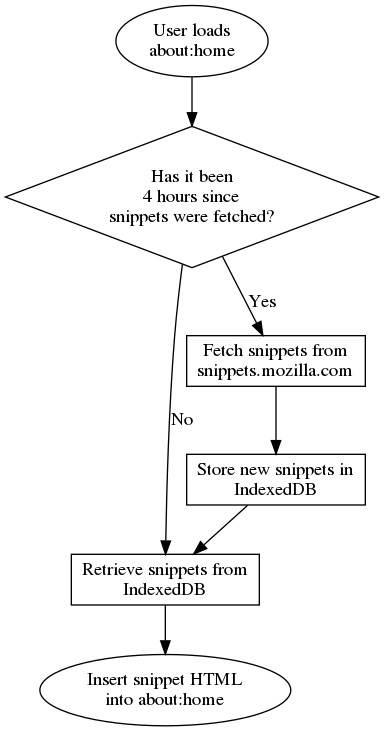 This document describes the snippet service and how it relates to about:home, the home page for Firefox. about:home is the default home page in Firefox. 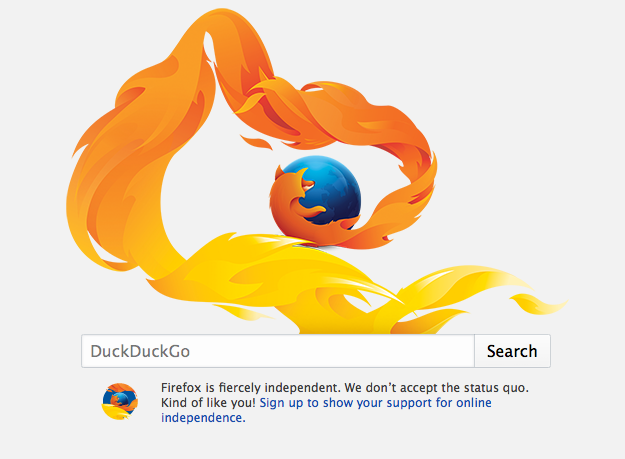 When you visit about:home, you normally see, among other things, a Firefox logo, a search bar, and a bit of text and an icon below the search bar. This text and icon are what is called a “snippet”. The Snippets Service is a web service that serves the code for snippets. Firefox downloads code from the Snippet Service and injects the code into about:home. This allows administrators using the service to control which snippets are being shown by Firefox without having to update Firefox itself. When a user visits about:home, Firefox checks to see when it last downloaded new snippet code. If it has been at least 4 hours, Firefox requests new snippet code from the Snippet Service and stores it in the cache along with the current time. After this, or if it hasn’t been 4 hours, Firefox loads the snippet code from the cache and injects it directly into about:home. All Firefox does is download snippet code from the service and inject it into the page. The rest of the logic behind displaying snippets is determined by the snippet code itself, as explained in the next section. A small block of CSS that is common to all snippets. Among other things, this hides all the snippets initially so that only the one chosen to be displayed is visible to the user. The code for each individual snippet, surrounded by some minimal HTML. Identifies all elements in the snippet code with the snippet class as potential snippets to display. Filters out snippets that don’t match the user’s location. See GeoLocation for information on how we retrieve and store geolocation data. Filters out snippets that are only supposed to be shown to users without a Firefox account. Filters out snippets that are only supposed to be shown to users with a certain search provider. Chooses a random snippet from the set based on their “weight” (a higher weight makes a snippet show more often relative to snippets with lower weights). Triggers a show_snippet event on the .snippet element. Modifies all <a> tags in the snippet to add the snippet ID as a URL parameter. Logs an impression for the displayed snippet by sending a request to the snippets metrics server. These requests are sampled and only go out 10% of the time. See also Data Collection chapter for more information on the data send to the metrics server. If no snippets are available, the code falls back to showing default snippets included within Firefox itself. © Copyright 2013, Mozilla Foundation Revision c0073f31.